Optical mice work by pointing a tiny cheap camera at the surface of your desktop, tracking the motion of ‘interesting’ points in the surface texture (woodgrain, imperfections, highlight/shadow) as the mouse slides around over it, and converting this to an X and Y motion. 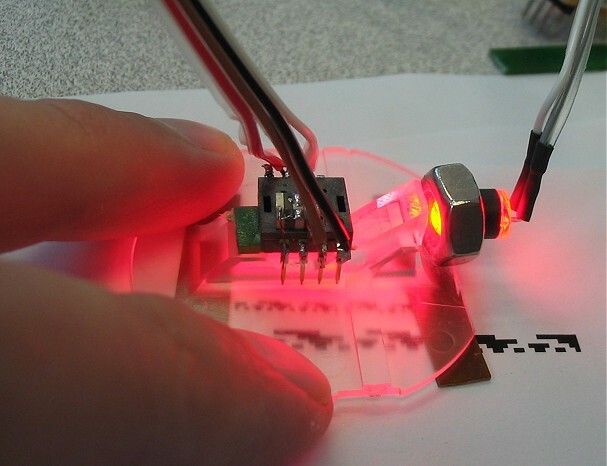 An LED is used to light the surface beneath the sensor, typically at a very low angle to help highlight any surface roughness (so the sensor still works on rough, but solid-colored, surfaces such as paper). Many of these sensors allow you to read out the raw image, too. Historically, the sensors in optical mice have been a standalone chip with SPI interface, leaving a separate microcontroller to handle button clicks and PS/2 or USB interface – so you could hack a cheap optical mouse to output position or image data for unique scanner or robotics projects. Unfortunately, more and more of these high-volume, low-cost devices are moving to all-in one camera+micro+USB chips under an epoxy blob, so you can’t just buy any old optical mouse and expect any access to this internal data. Fortunately, standalone SPI sensors are still alive and well. Mouser.com (no pun intended) sells some of these (Avago ADNS-2610 and ADNS-2620) for the exhorbitant price of $1.56 each. It’s a CAMERA for a buck fifty. Not exactly a *good* camera (grayscale, 18×18 resolution), but you can still do some neat tricks with it. Of course, you will still need a cheap optical mouse to steal the lens off of (or maybe an old CD player, etc.). If you want to be all lame and boring, you could use this mouse camera as, well, a mouse. An onboard DSP is constantly watching the surface below as it slides by, giving you an up-to-date relative position (DELTA_X and DELTA_Y) just by reading a pair of registers. Each ‘delta’ reading contains the number of +/- pixels the mouse has moved in each direction since the last time you read it. Since you are only reading 2 registers, you can read this information at very high speed. There are some additional registers that will give you the max and min brightness, sum of all pixel values, and a ‘surface quality’ value that represents the number of trackable points (divided by 2) under the imager. But if you want to dig deeper, a builtin diagnostic feature lets you bang some other registers and return the entire image under the camera. A few things worth mentioning before you go further, though: this IS meant as a diagnostic feature only; they sell these things as mice and not cameras after all, and this feature is not the best implemented. There are 324 pixels (18×18 array), but you can only grab one pixel per frame. So when you get the image, you are actually seeing pixels composited together from 324 separate frames across maybe 1/2 second. If the camera is moving during this time, you’ll get a garbled image, so if you have this puppy strapped to a robot to take pictures (or position the robot), your robot has to stop for pictures. Also, your maximum full-image rate is only a couple images per second. Following are some demos of monochrome and color image acquisition, surface identification and micro-position sensing down to the um range. The sensor’s great for reading that pesky fine print. The grayscale sensor can be used as a crude color imager by replacing the standard red lighting with an RGB LED, and taking one frame with each color lit in turn. Depending on the LED, you may have to scale the R/G/B frame data differently for more accurate color representation. I assume like most photodiode technology the mouse cam pixels are most sensitive to the red-IR range, but the LED I used had a pretty weak red, so it was kind of a wash. (The image here is scaled red=0.75, green=1, blue=0.75). Very simple position-finding routine I wrote for testing purposes; named after a magician’s trick where the blindfolded practicioner (renowned hypnotist Christopher Carter, in the first case I saw it) “reads” a name written on a dry-erase board by swiping a finger across it at a few different heights. This is a similar idea, using a basic edge-detection to identify regions (“where to read”), then read them by the brightness at the center of each region. In this method, you create a known optical pattern (in this example I used Gray Code) and apply it to the surface whose position you want to measure. Then aim the camera at it so that it looks at a small subset of the optical pattern at any given time. Ideally, each ‘pixel’ of the optical pattern should cover a 2×2 or more (3×3 or 4×4) pixel area on the sensor, since the optical pattern and the sensor’s pixels will never be *perfectly* aligned, and thus will blur across a couple neighboring pixels. Now you can identify the unique pixel pattern under the sensor and match it its position in the full optical pattern. In a project at work, we needed to know how far a visual indicator pin on a piece of machinery was extended at any given time, and whether its position was in tolerance (reducing human observation error in dark and foul weather conditions). Since the sensor could not be permanently attached, we also wanted to be able to measure slop or shifting of the sensor itself relative to the pin, which would produce an incorrect reading. 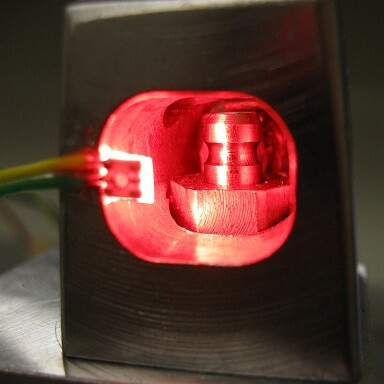 The small space, large pin travel and need for sensor cross-checking made common 1-D proximity sensors less attactive. Definitions: The “pixel grid” is the actual sensor array. For ADNS-26xx, this is always 18×18. A “region” is one individual mark in the optical pattern, corresponding to a 3×3 (etc.) region of the pixel grid as mentioned above. The “region grid” is the array of these regions overlaid somewhere on the pixel grid. For example, with an 18×18 pixel grid and each region 3×3 pixels, the region grid overlaid onto the sensor can be as large as 6×6. By performing this 2-stage lookup (find region grid offset on pixel grid, match region grid to known optical patterns), the total computation time is reduced by mainly working with only a small subset of the pixel data (the region grid), and the positioning resolution is at least (region size) and at most (pixel size). Working with only the center pixel of each region, to the extent possible (rather than e.g. averaging the entire region’s pixel values), is also beneficial since the regions may not be perfectly aligned to pixels and the focal plane at close range is very narrow (<1mm), thus the image may not be completely in focus – especially if looking at a curved or otherwise 3D surface. So all the pixels toward the edges of the region will tend to dilute the reading. Absolute 2D position encoding/decoding using a Gray Code pattern. 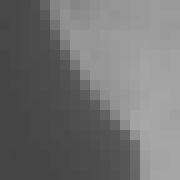 Position is resolvable generally to 1 pixel, in this case measured at about 2.4 mils (about 70um). The top-right shows the raw image with region grid (black squares) overlaid aligned to the strongest edges (pink crosshairs). The bottom-left shows the edge-detection itself, and finally, the top-left shows the recovered optical pattern. The actual position is the index of this pattern in the known fullsize pattern + the region grid’s offset. Perform edge detection by taking the derivative of the image. Embedded systems such as Arduino are barely suited for non-integer math, let alone calculus, but we can take a poor-man’s “discrete derivative” easily by just subtracting neighboring pixels. 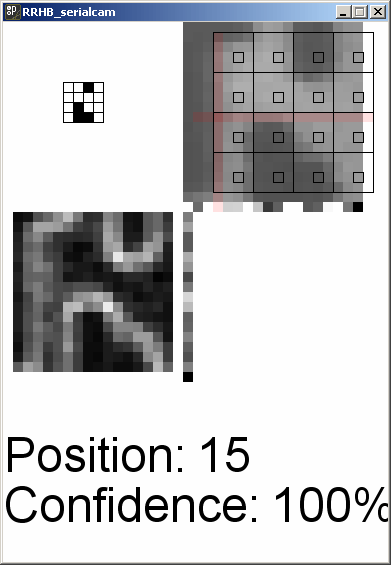 Neighboring pixels on a uniform surface will not differ by much, so subtracting two neighbors will yield a low number, while along an edge, one will be very different from the other. We want to figure the vertical and horizontal edges separately. And we don’t care about the exact location of ALL the edges per se, just want to know on which rows and columns they occur. Once at least one good, strong edge is detected in each direction (horizontal and vertical), we know where to align the region grid so it is centered on valid regions. For each horizontal row: For each pixel, its edginess (likeliness of being along a *vertical* edge) is given by the absolute value of (pixel – left neighbor) + the absolute value of (pixel – right neighbor). And of course that entire row’s vertical edginess is the sum of the edginess of all pixels in the row. For each vertical column: Same thing, only going by columns, taking the pixel directly above and below. Again, the column’s edginess is the sum of the edginess of all the pixels in the column. 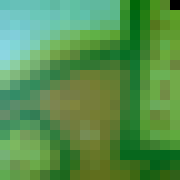 Obviously, the leftmost pixels has no left neighbors, and the rightmost pixels has no right neighbors (same goes for the top and bottom rows, they are missing neighbors on one side), so the easiest approach is to exclude them from the loops, e.g. for the 18×18 array, valid results start at (1,1) and end at (17,17). The result is an ‘edginess’ array of 16×16 pixels. Once the region grid is positioned, threshold the region centers to black/white, then take the resulting region grid (4×4 in this example) and slide it around on an array containing the ‘known’ pattern until the best match is found. Obviously, in a real-world system subject to bad lighting, specks of dust, misalignment or misfocus, the match will not always be perfect. You might also want to know how well you can trust the measurement, so I compute a confidence value too. The confidence value is a function of the absolute % of regions matched, and the difference between the best match and the next best match. For example, if two different positions matched equally well (even if they are both “pretty good” percentage wise), you can’t uniquely identify a position and so your confidence must be zero. 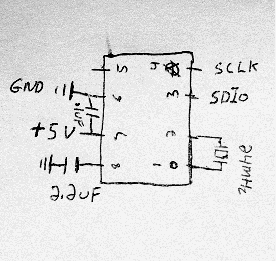 Another thing briefly tested was to place an LED behind the pin and observe its side profile (Alfred Hitchcock Algorithm? ), which worked surprisingly well. 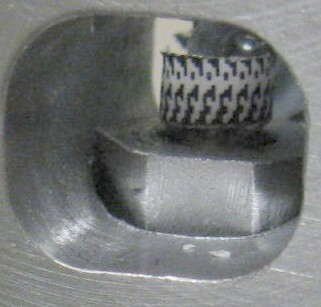 Side profile of the pin showing the lower part of the indicator groove. This entry was posted on Sunday, March 22nd, 2009 at 4:23 am	and is filed under gEEk. You can follow any responses to this entry through the RSS 2.0 feed. You can leave a response, or trackback from your own site. The library adns.zip (Arduino Library) is not fond on the server. It strikes me that this could be really cool for A-life robotics; the way this works reminds me of various organisms’ eyes which are sensitive only to motion. I once thought about trying something with an array of photocells, but this is a lot smaller and cheaper. @Waleed: The Arduino library download is fixed now. Thank M$ and its habit of sometimes, but not always, auto-capitalizing the names of files as they are created! Tim, what do you do with the 3rd pin of the oscillator? @anon and others: I should have been more clear on that. For 3-pin oscillators/resonators (i.e. those with built-in capacitors), tie the center pin to ground. For this application I highly recommend this type of resonator, it makes your life easy. @shaun: You could…but its resolution is poor. Are you trying to attach it to the eyepiece of a microscope, or use the camera as a microscope directly? Hi Tim, which version of arduino were you using when you run the program? I tried to use arduino-0016-win but nothing happen when I serial monitor it. or is there any software that need to work with it in order to grab the image? Hi I have recently down loaded the arduino library. and running in arduino software. but it is showing lot of error. Could you pl. help me out where to put this arduio files ? Is there any way to increase frame rates? anything like 3 or 4 frames wold be great. Hello, I’m attempting to use your arduino library as a basis for using the ADNS 5050 as it includes a couple of extra features. What changes do you suggest making in order to get it working? @Leo, I took a quick look at the datasheet on the 5050, and I doubt it would work as is shown here. I tried with the 5020 before going to the 2620, and I couldn’t get any results. But you would need to change a few of the addresses and registers, and the delay time. @George: It turns out that the main caveat with the ADNS 5050 is that the Reset and NCS pins must be grounded in order for the chip to operate properly. Otherwise it will not turn on properly. Also, the ADNS 5050 has some differences in terms of the addresses and address-data lag time (5us vs 100us). How Can i use this to ACCURATELY measure distance traveled? just by reading delta_Y pr delta_X? i tried it but calibration seems pretty impossible. How Can i use this to ACCURATELY measure distance traveled? just by reading delta_Y pr delta_X? Is there any video tutorial which will help me to convert a mouse into a image grabber ?? can you upload the processing code for 2D position project? What was the pin used to monitor? How did you transmit your data back to your HQ? What does pwr in code mean? I downloaded your lib, and I have a question. You set pwr and gnd by digital pins. Why is it better choose then arduino GND and 5V? Can you direct me to a site or something published that would have information regarding using a hacked mouse to detect motion. I would like to detect grit motion through a tube +/- 5/16 ID tygon tubing. I got an indication with a disassembled mouse connected to my computer. I would need to translate that into a motion no motion output for a machine we use. What is the difference between adns2610 and adns2620?